Leave your phone in your backpack. Our smartwatch apps let you view route guides and outdoor maps right on your wrist. We support both Apple Watch and Wear OS by Google. 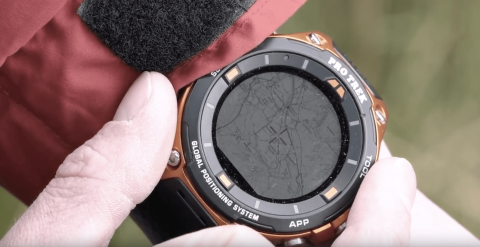 We also optimized our wear technology for Casio PRO TREK Smart watches. Pair your smartphone and smartwatch. Install ViewRanger on both devices. Find the route you want to follow in the ViewRanger app. From the route page, tap the smartwatch icon. The route and related offline maps will beam wirelessly (via Bluetooth) to your smartwatch. Note: ViewRanger sends the current map type selected on Map screen in the mobile app. If you are viewing ViewRanger Landscape maps, it will send that map type. If you are viewing Ordnance Survey maps, it will send that map style. Watch these videos for more screen-by-screen details.